Tonight I heated a flat slab of granite in the firepit, then used the rock to plank-cook two salted tenkara-caught cutthroat trout for dinner. Last night was windy, but the temperature warmed before morning. I didn’t have to sleep with my clothes on all night, and my socks dried out so my feet eventually got warm. We packed up this morning and hiked to the inlet of Little Lightning Lake. Big Lightning was rocked with a gale. Golden Trout were cruising the deeps and a black-silk-olive-hackle Kebari was the fly that fooled them. After spending the morning fishing here, we contoured around the northern toe of the north-central buttress of the Tumble-Chalice plateau to Jasper Lake. The going was fun. Granite talus, open whitebark pine forest, and flat benches that split the icky steep talus above us and cliffs and deadfall below. We arrived at Jasper Lake in the mid-afternoon, at which point we deployed our tenkara rods and enjoyed steady fishing for big cutthroat. Given the context (October at 9,000 feet, wind, and cold), we were pretty happy to land more than a few dozen healthy trout up to about 17 inches. They weren’t picky about flies but my favorite technique was skittering an October Caddis across the surface and watching the wake of an attacker before it hit the fly. Winds are swirling again above us as I write this by a hot fire in my down parka as a reminder that “it ain’t summer up here no more”. It’s hard to get up here, and it’s hard to get out. Tomorrow we descend several hours of talus, cliffs, and deadfall back to the West Fork. But we’ve been alone, and the trout have cooperated. 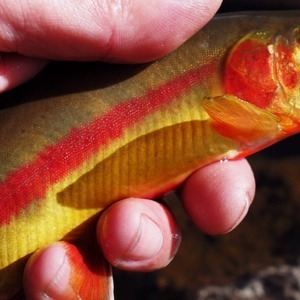 Photo: Golden Trout from the Lightning Lake basin.